Het is een cliché, maar een cliché is nu eenmaal met reden een cliché; het is de realiteit. De afgelopen week genoot ik van een bijzondere dag. Een dag vol emotie, een dag die een betekenisvolle wijn verdiende. Ik las op Facebook dat iemand zich aan een glas ‘Slurp’ waagde en realiseerde me hoe belangrijk het is om het kaf van het koren te scheiden en marketing-onzin niet met intrinsieke waarde en oprechte emotie te verwarren. 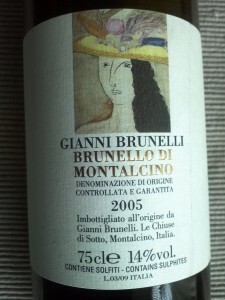 Ik koos daarom voor de 2005 Brunello di Montalcino van Gianni Brunelli, geen puntenmonster, maar een wijn met karakter en een verhaal, passend bij een heerlijke avond ‘in goed gezelschap’. It ’s a cliché, but a cliché happens to be a cliché for a reason: it’s reality. Last week I enjoyed a special day. An emotional day that deserved a meaningful wine. I read on Facebook that someone was going to drink a glass ‘Slurp’ and realized how important it is not to confuse marketing nonsense with intrinsic value and heartfelt emotion Therefore, I chose the 2005 Brunello di Montalcino of Gianni Brunelli, not a pointless points wine, but a wine with character, a story and the perfect match for a lovely evening in good company. 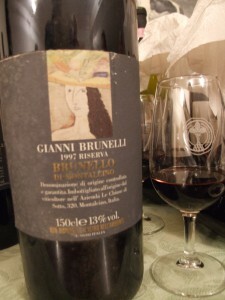 The wine was one of the last vintages Gianni Brunelli was allowed to make. Gianni Brunelli, the man who made such an impression on me before had to leave his so cherished life too early. It was about 20 years ago when we met. He was not my first love, but was the first man who kissed me. As a matter-of-fact, timid and very heterosexual Dutchman, he scared me by not only hugging me, but also giving me two prickling kisses. Prickling quite literally, because even though it was only on my cheeks, his short beard made me understand why it’s recommended to avoid any contact with porcupines and why women appreciate razors so much. 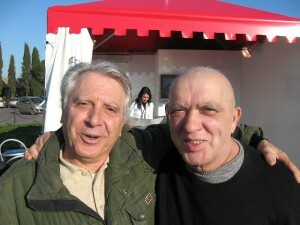 But in the end, it was the warm friendship that Gianni confirmed and made my cheeks glow, instead of his shaggy beard. intriguing women, music, art and all other pleasures of life. Although he didn’t bother to speak any English and my Italian was (and still is) very limited, we understood each other perfectly. Another cliché. Wine is not just emotion, but also communication. I knew Gianni Brunelli as a passionate visionary. He saw opportunities where others saw problems and made dreams come true. He was the mastermind behind the successful Osteria le Logge in Siena, the driving force of the winery Le Chiuse di Sotto and he laid the foundation for a wonderful wine bar opposite le Logge in the catacombs of Siena, carved out by hand centuries ago in the rocks deep beneath this wonderful city. In 1987 Gianni Brunelli bought Le Chiuse di Sotto, the domain northeast of Montalcino, where his father already planted a vineyard in 1947. Here he made a appraised by many Rosso and Brunello di Montalcino, as well as a blend with grapes other than Sangiovese and a very fine olive oil. In 1998, he transformed an old farmhouse into his office, house annex guest house ‘Podernovone’, close to Sant’ Antimo between Montalcino and Castelnuovo dell’Abata. 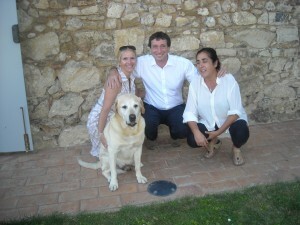 Here his dogs enjoy life while Gianni expanded his vineyards and made other future plans. Brunelli lived to share fine wines and healthy, biological food, both products of the generous Tuscan soil. In le Logge you could hear the cheerful noise of his Brunello as well as the reigning calm of his olive oil. The table reserved for friends and family was always too small to seat everyone, even though, somehow, there was always a place to join. All friends enjoyed the artisan meat and organically grown tomatoes, eggplant, zucchini, potatoes, artichokes and lettuces from Montalcino. From these pure products chef Nico Atrigna created unique, surprising, colorful and very tasty dishes; typically Tuscan, but with an international touch. Gianni Brunelli loved to work with Tuscan people but also hired professionals from the Veneto, Sardinia and Campania and was just as inspired by talents from Japan, America and Africa. He traveled throughout the United States, smoked big cigars in Cuba and married on a tropical beach with Laura. Everywhere he made friends and guests from around the world visited le Logge, le Chiuse di Sotto or Podernovone. Among them famous artists, musicians, painters, authors and thousands of other anonymous lovers. They all enjoyed the passion, humour, enthusiasm and hospitality of Gianni that is still tangible. He enjoyed the appreciation, the success, but also had to endure criticism and envy. He was accused of cooking just for the rich and being stuck to the “flavors of the past”. These critics forgot how much he invested, not just money, but also his time, his energy, his life. Why? Because Gianni wanted to show the world how important quality of life and health is and how questionable today’s consumer’s society is. The passion, conviction and love for his country, staff, friends and family always prevailed over the criticism. He continued to make the best wines possible, brought new impulses to le Logge and even made plans to go into politics. All this time Laura Vacca stood by him. Never in his shadow, even though Gianni was ‘the face’ of his companies. They always stood side by side, clearly in love with each other and completing each other with their own talents. From 78 rpm records, Mario Lanza sang to them and made them dance and live. They were inseparable and seemed invincible. Seemed, because mother nature showed how inexorable and merciless she can be. In 2007, Gianni became ill and lost the unfair battle late 2008. With dozens of friends, Natascha and I visited the memorial service in the Sant’ Antimo abbey. At some point, even the unbelievers among us were impressed when a ray of light pierced the misty silence and touched the audience for a moment. Gianni? 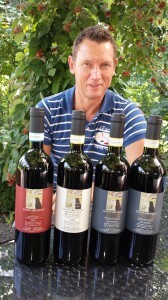 For many years, the wines of Gianni Brunelli were not available in the Netherlands, but lovers of fine Brunello were saved by Edwin Werkhoven. A few years ago he introduced the wines in the Netherlands and now they enrich various cellars of leading restaurants and passionate individuals. A few weeks ago Edwin Werkhoven granted me some of his time and we tasted several wines from his portfolio. 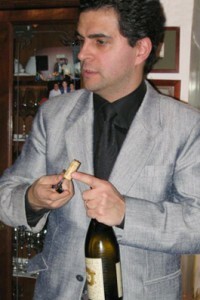 I was delighted to see that he also brought the wines of Gianni Brunelli. Together, we noted how Laura Brunelli-Vacca has successfully turned into an inspiring leader of her teams at le Logge and Podernovone, assisted by the multi-talented Valentina, her anchor Mirco Vigni, chef Nico, oenologist Laura Bernini and numerous friends from all around the world. Of course, life without Gianni is not the same, but Laura found a certain peace and balance. With confidence and convinced of the potential of her staff and vineyards she manages to continue to produce phenomenal wines and maintain Gianni’s reputation. I dare to say that the wines seem even better than ever. They radiate more energy, more character and the fact that (also) the vines have matured, echoes in the wines. The style of the wines haven’t changed. The quality of the grapes determines for which wines they will be used. Lighter structured grapes for the Rosso and, if the vintage allows it, a special selection of grapes for an always stunning Riserva. Because Laura owns several plots, each with their own identity, she can an ideal blend for her regular Brunello every year. The wine undergoes a medium lang soaking and fermentation in temperature controlled stainless steel tanks, followed by aging in 20/30 hl wooden casks of Slavonian oak. Total production is about 30.000 bottles, including the Amor Costanti, a blend of Sangiovese with some Merlot. The style of the wines is authentic, very clean, powerful but always drinkable. The result of respect for the fruit, the historical and cultural significance of tradition in Montalcino and common sense that is not blind to the reality and innovation. The wines can age exemplary as vertical tastings have shown. The Rosso peaks after 2 to 3 years of bottle aging (the 2011 is outrageous right now) and Annata van age without any problems for 10-20 years. I drank the 1991 two years ago and was impressed by the quality of this matured, but still very lively wine. The intensity of the Riserva huge, and shows an impressive aging potential. It’s not a wine to drink young, but to cherish for some in your cellar before enjoying it. Two days after opening a Riserva 2007, I found some wine left in the bottle; it was still in excellent condition. The Riserva 2006 and 2001 should last decades. And Amor Costanti? Without doubt a neat wine and there are silly American who rate it higher than the Brunello, but oh well…….. The prices of the wines are very reasonable and a small investment to make a great Christmas meal ‘just perfect’. Edwin Werkhoven can you all about the wines available and when you see or talk to him, do yourself a favour. 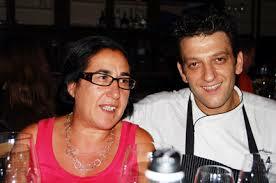 Also ask him about the truly great Nebbiolo of Mamete Prevostini from Valtellina and those of Brezza from Barolo. And don’t forget the outstanding Sauvignon Blanc Sanct Valentin of St. Michael Eppan…..
De wijn was één van de laatste jaargangen die Gianni Brunelli mocht maken. Gianni Brunelli, de man die zoveel indruk op me maakte en helaas veel te vroeg afscheid moest nemen van het door hem zo gekoesterde leven. Het was een jaar of 20 geleden toen ik hem voor het eerst zag. Hij was niet mijn eerste liefde, maar wel de eerste man die me kuste. Als nuchtere, schuchtere en heel erg heteroseksuele Hollander, schrok ik me het heen en weer toen hij me uit blijdschap omhelsde en me twee prikkelende zoenen gaf. Prikkelend in dit geval erg letterlijk, want ook al was het maar op mijn wangen, zijn korte baard maakte me duidelijk waarom je stekelvarkens doorgaans beter kunt mijden en waarom vrouwen scheerapparaten zo waarderen. Maar uiteindelijk was het eerder onze warme vriendschap die Gianni daarmee bevestigde en mijn wangen deden gloeien, dan het schuren van zijn ruige baardharen. In de loop van de jaren deelden we onze passie voor mooie wijnen, goed eten, intrigerende vrouwen, muziek, kunst en alle andere geneugten des levens. Hoewel hij vrijwel uitsluitend zijn eigen taal sprak en mijn Italiaans zeer beperkt was (en is), verstonden we elkaar prima. Nog maar een cliché; wijn is niet alleen emotie, maar ook communicatie. Ik leerde Gianni Brunelli kennen als een gepassioneerd visionair. Hij zag mogelijkheden waar anderen problemen zagen en zorgde dat dromen werkelijkheid werden. Hij was het brein achter het uiterst succesvolle restaurant le Logge in Siena, de drijvende kracht achter het wijndomein Le Chiuse di Sotto en hij legde de basis voor een prachtige wijnbar schuin tegenover le Logge, in de diepe catacomben van Siena, eeuwen geleden uitgehouwen in de rotsen. In 1987 kocht Gianni Brunelli Le Chiuse di Sotto, het domein ten noordoosten van Montalcino, waar zijn vader al in 1947 een wijngaard aanlegde. Hij maakte er niet alleen een Rosso en Brunello di Montalcino, maar ook blends met andere druiven dan Sangiovese en uiteraard een zeer fraaie olijfolie. In 1998 toverde hij een oude boerderij om tot zijn kantoor, woonhuis en gastenverblijf ‘Podernovone’, even voor Sant ‘Antimo tussen Montalcino en Castelnuovo dell’Abata. Hier genieten zijn honden van het leven en breidde Gianni er zijn wijngaardareaal en plannen verder uit. Brunelli werkte onverstoorbaar door aan zijn levenswerk; het delen van mooie wijnen en gezond eten met een biologische oorsprong uit het gulle Toscaanse land. In le Logge klinkt het vrolijke lawaai van zijn Brunello, heerst de kalmte en stilte van zijn olijfolie en is de stamtafel altijd te klein om alle vrienden te ontvangen. Hier vinden ambachtelijk vlees en biologisch geteelde tomaten, aubergine, courgette, aardappelen, artisjokken en slasoorten uit Montalcino de borden van liefhebbers van deze pure producten. Chef Nico Atrigna weet de ingrediënten om te toveren tot unieke, verrassende, kleurrijke en zeer smakelijke gerechten, waarin allerlei internationale invloeden merkbaar zijn. Gianni Brunelli werkte altijd al met mensen uit Toscane, maar liet zich minstens zo vaak bijstaan door professionals uit de Veneto, Sardinië en Campanië of zich inspireren door talenten uit Japan, Amerika en Afrika. Hij reisde door de Verenigde Staten, rookte dikke sigaren op Cuba en trouwde op een tropisch strand met zijn Laura. Overal maakte hij vrienden. Gasten uit de hele wereld bezoeken ook nu nog le Logge, Le Chiuse di Sotto of Podernovone. Onder hen beroemde kunstenaars, artiesten, musici, auteurs en duizenden andere anonieme liefhebbers. Allemaal genoten ze van de passie, humor, enthousiasme en gastvrijheid van Gianni die nog altijd tastbaar zijn. Hij genoot van de waardering, het succes, maar kreeg ook kritiek en afgunst te verduren. Hij werd verweten alleen nog maar voor de rijken te koken en vast te houden aan “de smaken van het verleden”. Deze criticasters vergaten hoe hij zijn naam, geld en leven op het spel stelde om zijn droom werkelijkheid te maken. Gianni wilde de wereld tonen hoe belangrijk kwaliteit en gezondheid zijn en hoe verwerpelijk de consumptiemaatschappij is. Zijn passie, overtuiging en liefde voor zijn land, personeel, familie en vrienden leden niet onder de kritiek. Hij maakte fraaie wijnen, zorgde voor nieuwe impulsen in le Logge en maakte zelfs plannen om de politiek in te gaan. Al die tijd werd Gianni bijgestaan door Laura Vacca, de vrouw die eigenlijk nimmer in zijn schaduw stond, ook al was Gianni het gezicht van zijn bedrijven. Ze stonden altijd naast elkaar, vervulden elkaar zichtbaar met liefde en completeerden elkaars talenten. Mario Lanza spoorde ze vanaf 78 toeren platen aan om te dansen, te genieten, te leven. Ze waren onafscheidelijk en leken onoverwinnelijk. Leken, want moeder natuur toonde zich onverbiddelijken onbarmhartig. In 2007 werd Gianni gegrepen door een slopende ziekte, waaraan hij uiteindelijk eind 2008 overleed. Met tientallen vrienden bezochten Natascha en ik de herdenkingsdienst in de Sant’ Antimo en zelfs de ongelovigen onder ons waren onder de indruk toen op een meditatief moment een lichtstraal de mistige stilte in de abdij doorboorde en de aanwezigen beroerde; Gianni? Lange tijd waren de wijnen van Gianni Brunelli niet verkrijgbaar in Nederland, maar liefhebbers van een mooie Brunello werden gered door Edwin Werkhoven. Een paar jaar geleden introduceerde hij de wijnen in Nederland en nu verrijken ze diverse kelders van vooraanstaande restaurants en gepassioneerde particulieren. Enkele weken geleden gunde Edwin Werkhoven me wat van zijn tijd en proefden we verschillende wijnen uit zijn assortiment. Tot mijn vreugde ontbraken de wijnen van Gianni Brunelli niet. Samen stelden we vast hoe Laura Brunelli-Vacca haar dienende rol op uiterst succesvolle wijze heeft omgezet in een leidende. Ze stuurt haar teams in le Logge en Podernovo voorbeeldig aan, bijgestaan door multi-talent Valentina, haar steun en toeverlaat Mirco Vigni, chef Nico, oenoloog Laura Bernini en talloze vrienden uit binnen- en buitenland. Het leven zonder Gianni is niet hetzelfde, maar ze heft na enkele jaren een zekere rust gevonden, haar positie en een goede balans. Ze heeft vertrouwen in haar eigen kunnen, is overtuigd van het potentieel van haar wijngaarden en weet de naam van Gianni hoog te houden met fenomenale wijnen. Ik durf zelfs te stellen dat de wijnen beter zijn dan ooit. Ze stralen meer energie uit, meer karakter en het feit dat ook de wijngaarden zijn gerijpt, weerklinkt in de wijnen. Aan de stijl van de wijnen heeft Laura niks veranderd. De kwaliteit van de druiven bepaalt voor welke wijn ze geschikt zijn. Lichter gestructureerde druiven voor de Rosso en als het jaar het toestaat een speciale selectie van eminente druiven voor de Riserva. Omdat ze de beschikking heeft over diverse percelen met elk hun eigen identiteit, kan ze jaarlijks een ideale blend maken voor haar reguliere Brunello. De most ondergaat een middellange weking en gisting die plaatsvinden in temperatuur gecontroleerde tanks van roestvrijstaal. De opvoeding geschiedt in 20/30 hl grote houten vaten van Slavonisch eiken. In totaal bedraagt de productie zo’n 30.000 flessen, inclusief de Amor Costanti, een blend van Sangiovese met wat Merlot. De stijl van de wijnen is authentiek, zeer schoon, krachtig maar drinkbaar; het resultaat van respect voor het fruit, de historische en culturele betekenis van traditie in Montalcino en gezond verstand dat niet blind is voor de realiteit en innovatie. De wijnen rijpen voorbeeldig, zoals verticale proeverijen hebben aangetoond. De Rosso toont zich optimaal na 2 tot 3 jaar flesrijping (de 2011 is nu schandalig lekker) en de Annata gaat zonder problemen 10-20 jaar mee. Ik dronk de 1991 twee jaar geleden en was onder de indruk van deze iets gerijpte, maar nog altijd levendige wijn. De intensiteit van de Riserva wijn is enorm, het potentieel indrukwekkend. Geen wijn om jong te drinken, maar om de nodige jaren te koesteren en om er dan lang, zeer lang van te genieten. Een restantje van de Riserva 2007 bleek na twee dagen nog altijd in uitmuntende conditie en ik denk dat de Riserva’s uit 2006 en 2001 nog decennia meegaan. En de Amor Costanti? Zonder twijfel een nette wijn en er zijn Amerikaanse sukkels die hem hoger waarderen dan de Brunello, maar ach……..
De prijzen van de wijnen zijn alleszins redelijk en een kleine investering om een geweldige kerstmaaltijd te vervolmaken. Edwin Werkhoven vertelt u er graag alles over en vraag hem dan meteen even naar die fantastische Nebbiolo’s uit Valtellina van Mamete Prevostini, die van Brezza uit Barolo of de uitmuntende Sauvignon Blanc Sanct Valentin van St. Michael Eppan…..